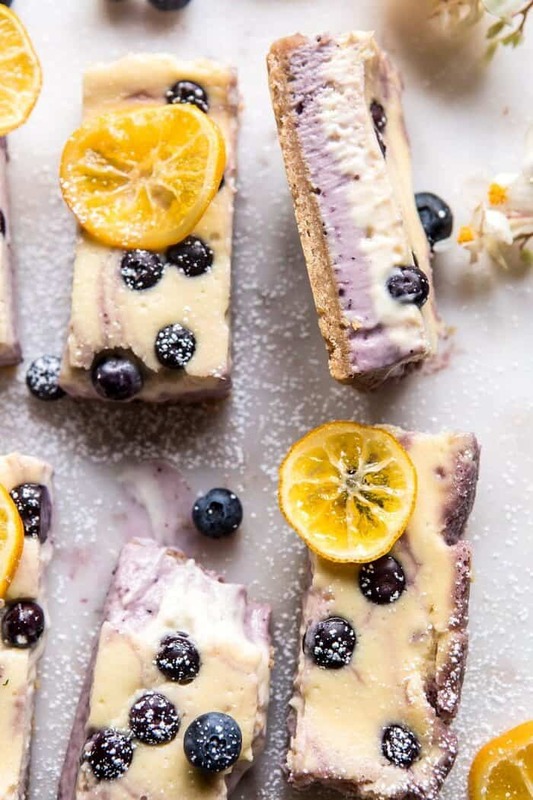 Sharing something different today, Blueberry Lemon Cheesecake Bars with Candied Lemon. Happy Friday! I am so excited for today’s recipe because I’ve never shared a cheesecake here on HBH, and today is finally the day. In all honesty, I never grew up eating cheesecake. In fact, I’ve really only had it a few times and I think the first time was only a couple of years ago. If you’ve been reading the blog for a while, you know that my mom raised her kids to follow in her chocoholic footsteps. Meaning we did not eat fruit based desserts growing up, and instead enjoyed chocolate cakes, chocolate chip cookies, chocolate pies, and chocolate peanut butter bars. See the theme? All things chocolate and all the time. Totally not complaining in any way, but this does mean that we never knew how delicious non-chocolate desserts, like cheesecake, could be. Thankfully, I grew up, learned some things about cooking and baking, and was forced to step outside of my little chocolate comfort zone and try some new desserts…cheesecake being one of them. 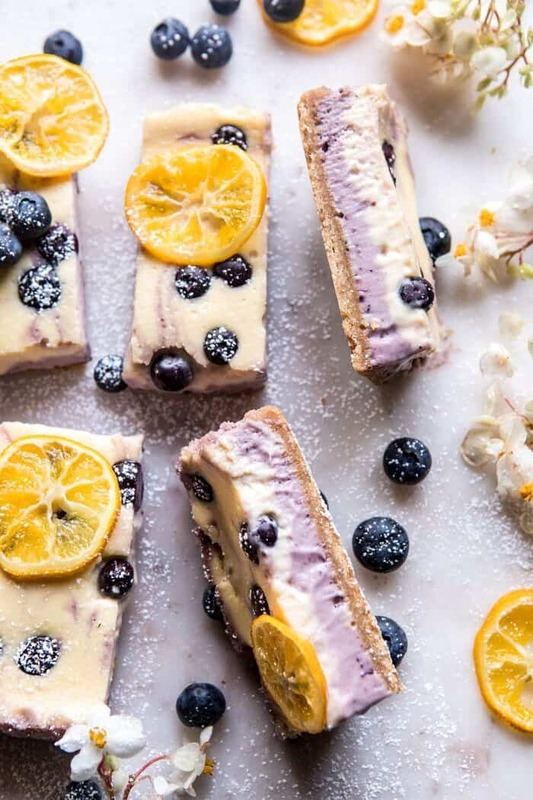 And that’s where today’s blueberry lemon cheesecake bars come in. 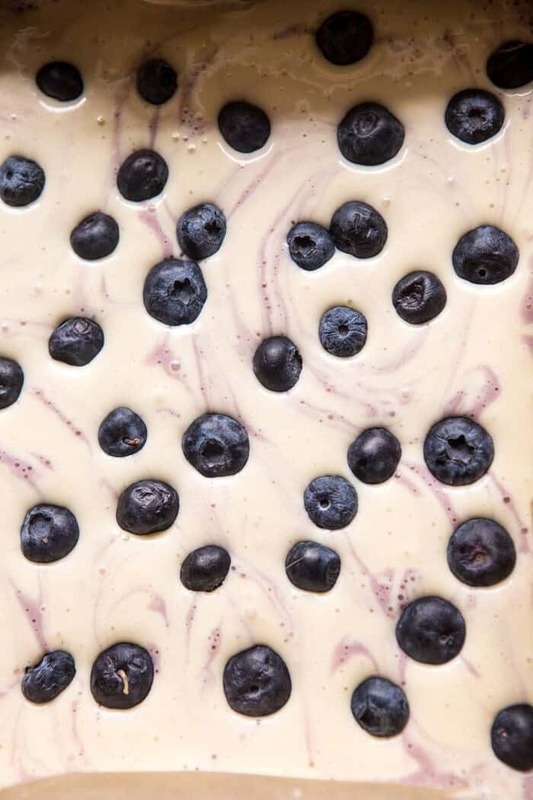 Made using my go-to Land O Lakes® Butter and all the fresh blueberries I could get my hands on…these bars could not be any more delicious. SO, here’s the story. You guys have probably noticed that I am really, really into spring this year, and really into making lighter desserts. I’ve tried out some cakes and have now moved on to cheesecake. With everything I do, I like what I make to be different from anything I’ve shared with you guys before. I know blueberry cheesecake isn’t a new concept, but I personally have never made it. 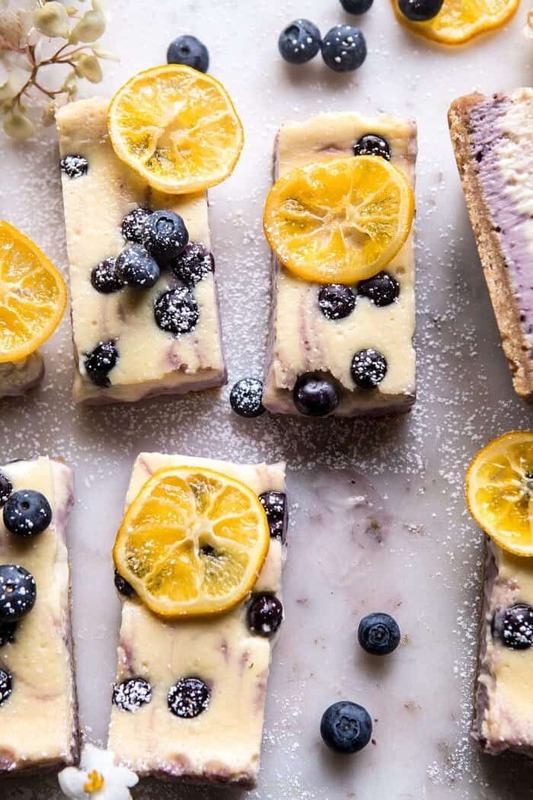 Plus, these cheesecake bars are not like any cheesecake you have had before. These bars are filled with sweet blueberries, both fresh and in jam form. They are light and airy and packed with fresh lemon flavor. And my crust? It’s of course extra buttery, because if you’re going to take the time to make a crust for your dessert, it needs to be extra buttery. It just does. Speaking of my crust, mine is simple…graham crackers and butter. 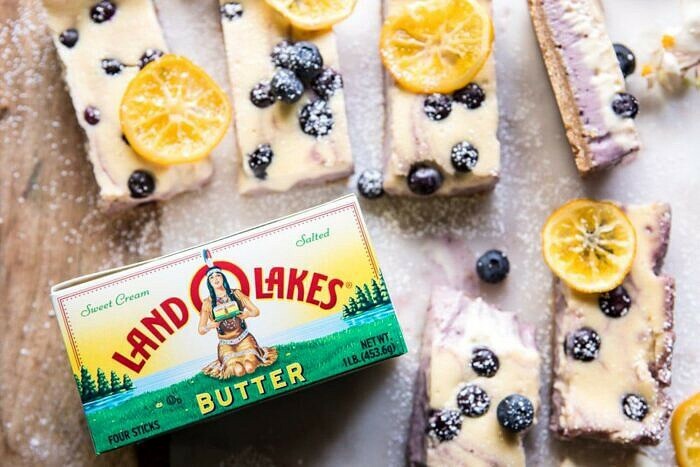 There’s not a lot of ingredients or anything fancy, but my Land O Lakes® Butter shines through flavor wise and the graham crackers add a nice crunchy sweetness. 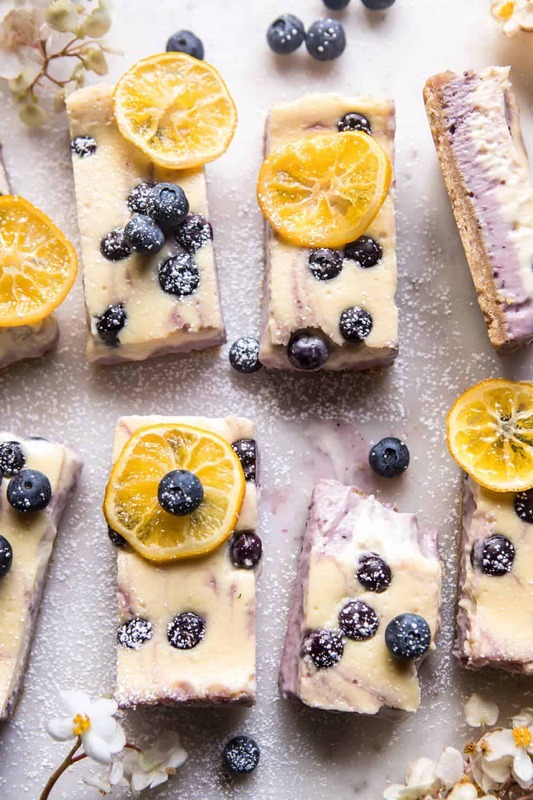 It’s the perfect base to hold these cheesecake bars together. For the filling, I really wanted a cheesecake flavored heavily with blueberries and hinted with lemon. To give the cheesecake ample blueberry flavor, I used a combo of blueberry jam and fresh blueberries. I love how the jam has a more concentrated blueberry flavor. It’s so intense and so delicious when paired with the cream cheese. I then sprinkled fresh berries on top…they burst in your mouth with every single bite. To add one last pop of both flavor and color, I finished my bars off with candied Meyer lemon slices. While these are not a must for this recipe, they do add a special touch and make the bars feel extra springy! Speaking of spring, I am in LA today working on a fun and very springy project and wishing I had these bars to share with everyone on the shoot. They’re perfect for brunch, Easter, or upcoming Mother’s Day! If you don’t love blueberries, you can easily swap in a berry you do love. Strawberries, blackberries, and even oranges would all be so good. What I also love about these bars is that they can be made a couple of days ahead of time, and even travel well too. Meaning, if you’re not hosting brunch, but need to bring something, these bars should be your recipe. Trust me, everyone will love them…and in turn they’ll love you for bringing them. These bars are filled with sweet blueberries, both fresh and in jam form. They are light and airy and packed with fresh lemon flavor. And my crust? It's of course extra buttery! 1. Preheat the oven to 350 degrees F. and position a rack in the middle of the oven. Line an 8x8 inch square baking dish with parchment paper and grease lightly with butter. 2. In a small bowl, mix together the graham cracker crumbs and melted butter. Press the mixture into the bottom of the prepared baking pan. 3. In a medium mixing bowl, beat together the cream cheese, sugar, and honey. Add in one egg at time until the eggs are fully incorporated. Add the lemon zest, lemon juice, and vanilla and beat until the mixture is smooth. Divide the batter in half. Stir the blueberry jam into 1 half of the batter. 4. Pour the blueberry batter over the graham cracker layer. Now gently pour the plain batter over the blueberry batter, the batters will mix. Using a knife, gently make swirls throughout. Sprinkle the blueberries over top. Transfer to the oven and bake for 30-35 minutes, until just set, but still a little jiggly in the center. Allow the bars to chill in the pan for about an hour, then transfer to the fridge to chill completely, at least 3 ours. Cut into bars and serve topped with candied lemon slices (recipe follows). 1. Combine the sugar, 3/4 cup water, and the lemon juice in a 10-12 inch skillet. Bring to a boil over medium-high heat, stirring until the sugar dissolves, 3 to 4 minutes. Add the lemon slices and simmer until tender and translucent, about 10 minutes. Remove from the sugar and place on a parchment lined cookie sheet. Allow to dry before adding to the tart, about 2 hours. The recipes here are fantastic. I confess I’m not a huge fan of the combo lemon and blueberry byt they sure look good! 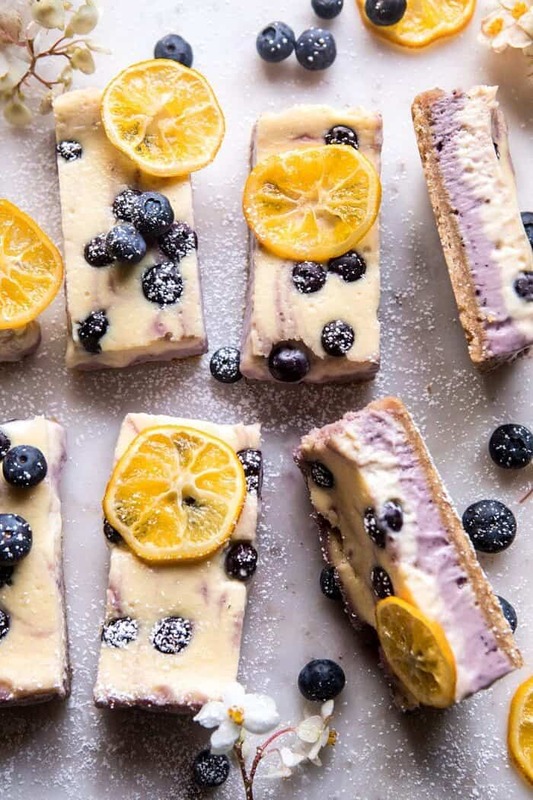 That’s a great combination of lemon-blueberry with cheesecake. 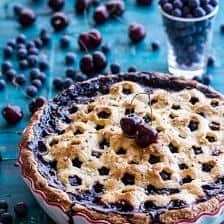 I like the use of the blueberry jam in the recipe. You don’t normally see that. Check out Bonne Maman Blueberry Preserves (if you haven’t tried it). This looks amazing! I absolutely cannot wait to make them this weekend to bring to work on Monday. Thanks for these very spring-y recipes. 🙂 Now all we need is the spring weather. Oh my, lemon-blueberry is the BOMB!!! Cannot wait to try! Oh yes! These bars are just what the Spring doctor ordered! They look amazing! These look great and a perfect spring treat. These are gorgeous, and they sound sooooo good! I love anything with blueberries and lemon! So beautiful! 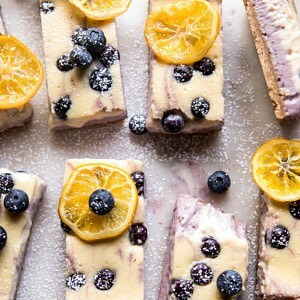 I love blueberry and lemon desserts! 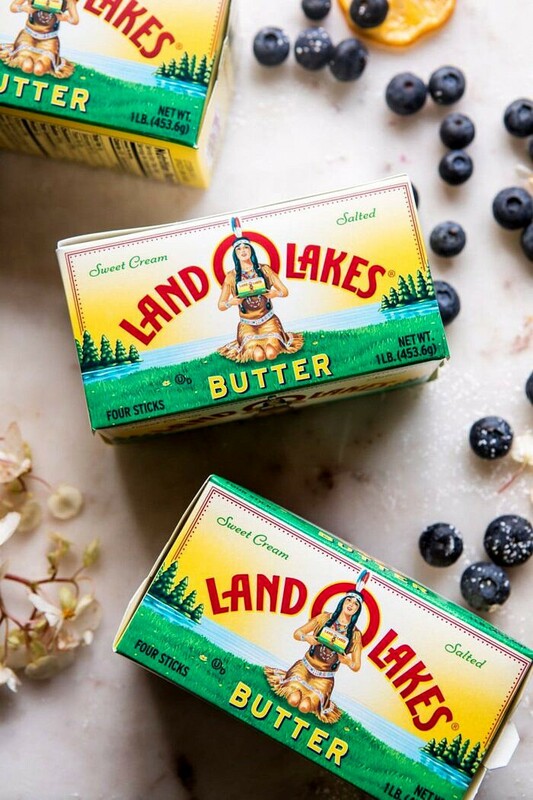 Love Land O Lakes butter! And love these bars Tieghan! The flavors scream spring is here! Thank you so much Antri! Oh my goodness. You’ve done me in this time. This recipe is going straight to the TOP of the to-do list. A friend and I are already making plans. So fun! I hope these turn out amazing for you and your friend Kacie! Thank you!! These are the perfect Spring dessert! So beautiful too! 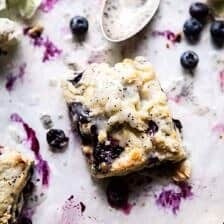 I love these blueberry bars and the addition of the blueberry jam with the cheesecake! I’ve made cheesecake a few times before and like making it, but I agree I like to do something different. I’ll have to give this cheesecake a try for when I visit my mom again. 🙂 Also, I agree that the butter matters in the crust and will have to use a good butter when making it. I hope you’re enjoying LA! Haha do you recommend anywhere to go for when I visit? I hope the shoot is going well and you’re able to enjoy the break! Hi Kristin! I hope you love these and I am sure your mom will! Thank you! When are you going to LA? So exciting! That is a lovely bar! Since it looks so amazing I’m sure it would taste great too! I’m just thinking if I use normal butter instead of the one you have used, should it be unsalted butter or should it be salted butter? Btw, the addition of lemon gives it such a radiant color, it makes it so appealing to the eye. Thank you! Hopefully she will like them. Maybe they’d be a good brunch with tea? I am sure they would be great for brunch! That is so exciting that you are going to be in LA! There are SO many places I have eaten at and been that I just love and would love to share with you! I hope you have the best time! So happy you are sharing these, amazing! These bars and I have been at work for about an hour. The bars are about a third of the way gone, and it looks like it’s an office favorite. Thanks again for this recipe! That is so great! Thank you Erica! Your desserts always look so amazing. At my store the lemons can be tiny or HUGE. How much lemon juice needs to go into the batter when mixing up the bars. 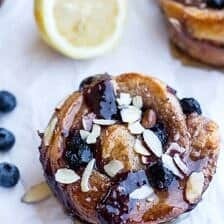 Tried these with raspberry instead of blueberry over the weekend and they were a hit! I am so glad you enjoyed these Lisa! Thank you! Hi! These look amazing- I want to make these for an early Easter brunch- is it possible to make the night before and let them chill in the refrigerator over night? 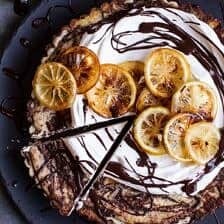 I want to make this for Easter lunch, can I use the recipe the exact way it is for a round cheesecake instead of bars? So SO wonderful! I made these to take to our family Easter celebration and they were delicious! Mine took a little longer to cook, but I think it is because I used a giant lemon, so the batter was probably a little looser to start. Thanks for the great recipe!! I am so happy you enjoyed these! Thank you Lisa! I hope you had a wonderful Easter! I baked these and took them along to my family Easter gathering on Sunday. They were a smashing success! Thank you for noting that I should buy Meyer Lemons – I think they made all the difference! These bars will be definitely be repeated. I am so glad these turned out amazing for you Beth! Thank you!! I was looking at this recipe and decided to read the reviews. Very surprised how a recipe got 5 star reviews when most of the commentary was from people who have not made these bars. Hi Pat! Many people like to rate the photos and the post in general because they like the content. I hope you love these bars if you choose to make them! Hi there, do you mean 8 ounces of cream cheese in total or 16 ounces in total? Thanks! HI, I’m planning to make these for a July 4th BBQ. I have a box of Graham Cracker Crumbs that I had leftover from another recipe. Do you know how many cups of crumbs I would need to approximate 9 sheets of graham crackers? HI! I have not tried using vegan ingredients, so I am not sure how this would turn out. If you are comfortable with testing it out, I say go for it! Let me know how it goes and Happy 4th of July! This recipe was amazing! I made it with my friend and she loved it so much that she made it again on her own a week later. Do you think you could publish a matcha or black sesame cheesecake recipe sometime soon?? I am so happy to hear that! I will try to make something like that! Thanks for the suggestions Sayuri! This was an amazing recipe; I’ve already made it twice! People love it. I just wanted to know– the bars tend to be a little soft/gooey even after chilling overnight. What are your suggestions? Awesome Monique, all of them can be added as my morning ritual recipes. This looks amazing! I want to make it this weekend. Do you think it would work as “mini cheesecakes” baked in a muffin pan instead?